A Not-for-Profit local environmental initiative that puts projects in the ground! We are comprised of 12 directors and 2 employees. We rent a small office at 86 Huron Street in downtown Ripley, ON to conduct our day to day business. All of our directors are volunteers and do not get compensated for all the hours and labour they put into each project. Our employees are paid a fair wage to coordinate the projects, conduct the accounting, and write grants and reports for funding opportunities. We also reach out to local 4H groups and school classes to conduct field trips, as Outreach and Education is mandated within our constitution. The Pine River Watershed Initiatives Network (PRWIN) was started in the year 2000 by a group of citizens concerned about the water quality in the Pine River. It became obvious that heat, moisture and nutrients cause algae growth. In September 2000, a letter was drafted and sent to SVCA, Huron-Kinloss Council, and Bruce County Public Health requesting a meeting re: water quality. Mayor Stuart Reavie and clerk Laura Haight convened the first meeting on December 1, 2000, in the Huron-Kinloss council chambers. A proposal entitled “A Plan for Improving Water Quality in the Township of Huron-Kinloss” was presented. Later, A clear vision to help establish “Clean Water and a Healthy Ecosystem Within The Pine River Watershed” was agreed upon and our four main goals were created and included in our Constitution (found in Learn More/Documents). To date (Spring/Summer 2016) we have planted over 250,550 trees; created 21 wind breaks; constructed 11 berms; built 6 cattle crossings; developed 6 wetlands; restored 5 stream banks; supplied 3 alternative solar power water supplies; installed over 10 kilometres of livestock exclusion fencing; and created annual educational programming for local youth. In 2012 the Pine River Watershed was named the top priority watershed on Lake Huron. Subsequently, our Project Coordinator helped published the “Integrated Watershed Management Plan”. This 80 page document outlines a five year plan for the Pine River Watershed, including core projects in a) education and outreach, b) vegetation cover; c) increasing water storage on the landscape and, d) controlling erosion. These core projects will help correct and sustain the Pine River watershed. PRWIN has a unique reputation with our community. We are known for our great work, and have developed a very approachable relationship with the local landowners. We are respected. Trusted. We have a growing list of projects personally requested by concerned local landowners. Berms, tree planting and cattle crossing are the majority of project requests. 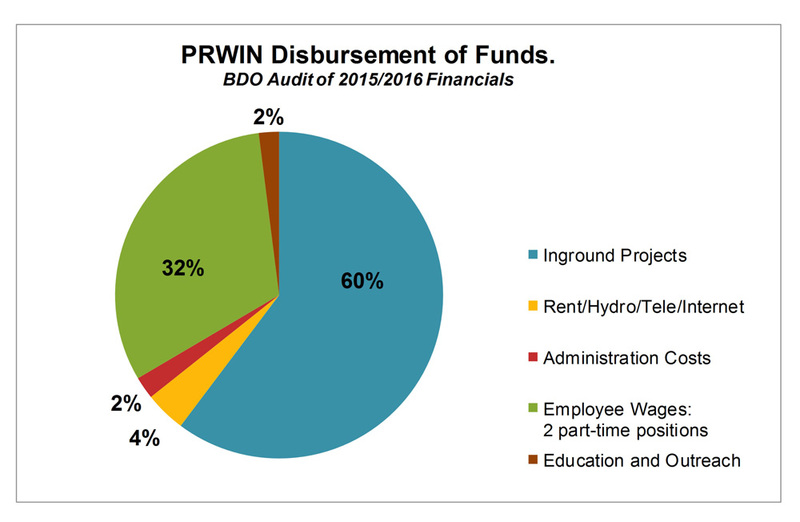 Going forward, PRWIN needs financial support from area businesses and citizens to implement these projects, and help to keep our office doors open. In 2015 we created the PRWIN Sponsorship Program to help fundraise to achieve our goals. The following retired PRWIN Directors will always be PRWIN Members! The following gentlemen gave countless volunteer hours to our organization. 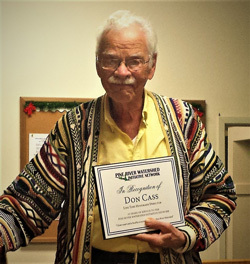 It was through their leadership and dedication that our vision of “Clean water and a healthy ecosystem within the Pine River watershed“ became an obtainable goal. Don Cass (multi-coloured cardigan) Don Cass has been involved as a volunteer Director with PRWIN for 15 years. 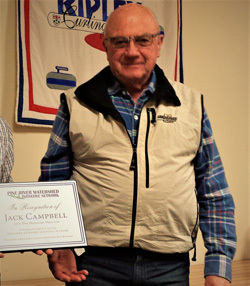 Jack Campbell (Vest) Jack Campbell has been with our organization for over 20 years and still helps plant trees in the Spring! 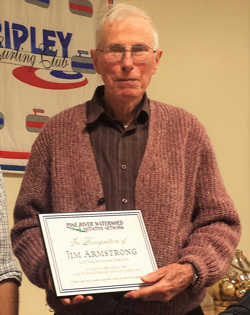 Jim Armstrong (burgundy cardigan) Jim Armstrong still has his finger on the PRWIN pulse after 15 years of dedication.